Co-rotating screws are used in many branches of industry for producing, preparing and/or processing highly viscous materials. They find a wide variety of applications especially in the plastics, rubber and food industries. Co-rotating twin-screw machines usually have modular configurations and are thus quite flexible for adapting to changing tasks and material properties. Well-founded knowledge of machines, processes and material behavior are required in order to design twin-screw extruder for economically successful operations. This book provides basic engineering knowledge regarding twin-screw machines; it lists the most important machine-technical requirements and provides examples based on actual practice. Better understanding of the processes is emphasized as this is a prerequisite for optimizing twin-screw designs and operating them efficiently. 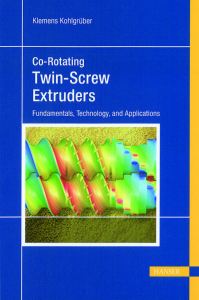 Besides basic functions, such as compounding, the book focuses on the historical development of twin-screws, the geometry of the screw elements (fundamentals, basic patents, patents overview), material properties and material behavior in the machine, fundamentals of feed behavior, pressure build-up and power input, examples of applications for various processing tasks, compounding: tasks, applications, processing zones, potential and limits of modeling, scaling-up various processes, and machine design including drives and materials. In a very practical and down-to-earth way the author explains how quality in extrusion can be measured, controlled, and improved. In particular, he conveys an understanding of how extruders should be controlled and what good, closed-loop controls can accomplish. 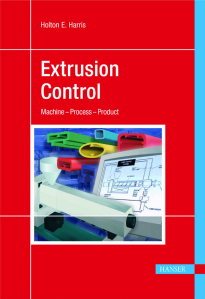 The author's approach and style clearly conveys that he has been involved in this field for many years and that he knows from experience what kind of problems an extrusion operator faces and how to successfully tackle these problems. This book is a helpful tool to improve and stabilize the extrusion process, thus facilitating a more profitable operation. 作者: Campbell, G., Spalding, M.
The book teaches the fundamentals of single-screw extrusion such that fast troubleshooting and process optimization and design are possible. The fundamental processes that are occurring in the machine are developed from the natural reference point of a rotating screw rather the traditional rotating barrel. These fundamentals are then combined with the chemistry of polymers and the physical properties related to processing to troubleshoot and optimize extrusion processes. Many industrial extrusion problem case studies are presented. In each case study, the root cause of the problem is identified along with the solution. A fundamental view of the processes that occur in a single-screw machine from the natural reference frame; i.e., screw rotation. The theory is discussed and compared to experimental data and to a rotating barrel reference frame. Topics include: polymerization chemistry and degradation mechanisms for polymers, physical properties related to processing (e.g., rheology, heat capacity, dynamic friction, bulk density and pellet compaction, melt density), and 30+ case studies for troubleshooting extrusion problems. A detailed description of the problem and the solution is presented so the reader can implement the solution on their own equipment. Mark A. Spalding is currently a Fellow in the Materials & Parts Processing Group (MPP) in Midland. He joined Dow in 1985 after completing a BS degree from The University of Toledo (1979) and a MS and Ph.D. (1985) from Purdue University, all in Chemical Engineering. Mark has held a number of technical positions in Corporate R&D, Polystyrene R&D, Plastics R&D, and INCLOSIA* Solutions. He is the author of over 100 technical publications. His expertise is in single-screw extrusion and related polymer processing technologies. He has solved some of the most complicated extrusion problems at Dow customer’s plants by developing and applying sophisticated troubleshooting methods. These solutions have created considerable value to both Dow and to our customers. He has designed extrusion systems for most of Dow’s major customers for virtually every resin that Dow produces. He is a Fellow and an Honored Service Member (HSM) of the Society of Plastics Engineers (SPE). The widespread use of large scale units for manufacturing blown film, blow-molded articles, flat film, and extruded pipes necessitates troubleshooting on site. 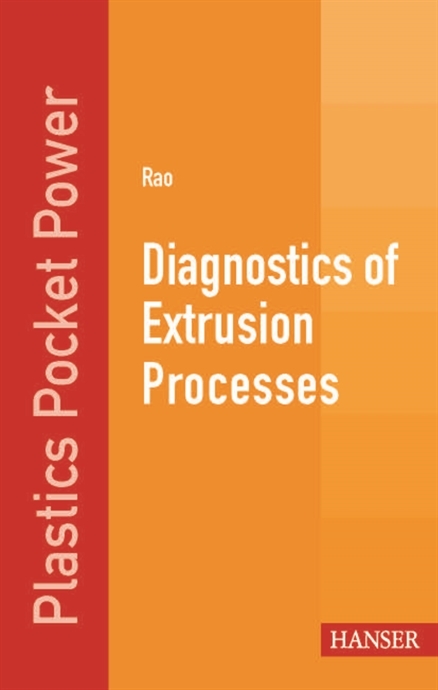 This book provides practical computational tools which can be applied easily on the shop floor to obtain quick solutions in these and many other areas of polymer extrusion. Natti S. Rao obtained his B. Tech (Hons) in Mechanical Engineering and M. Tech in Chemical Engineering from the Indian Institute of Technology in Kharagpur, India. He received his Ph.D. in Chemical Engineering from the University of Karlsruhe in Germany and then joined BASF AG as a senior research scientist. Later he served as a technical adviser to the leading machine and resin manufacturers in various countries. Dr. Rao has published over 70 papers and authored five books on designing polymer machinery with the help of computers. Prior to starting his consulting company (Plastics Solutions International) in 1987, he worked as a visiting professor at the Indian Institute of Technology, Chennai (Madras). Besides consulting, he holds seminars on computer-aided design of polymer machinery. Dr. Rao gave lectures on polymer engineering at the University of Texas Austin and is presently involved in continuing education at UMass Lowell. Dr. Rao is a Fellow of the Society of Plastics Engineering (SPE). Troubleshooting extrusion problems is one of the most challenging tasks for everyone involved in extrusion operations. It requires a good understanding of the extrusion process, knowledge of the material properties, good instrumentation, good analysis tools, and a systematic and logical approach. 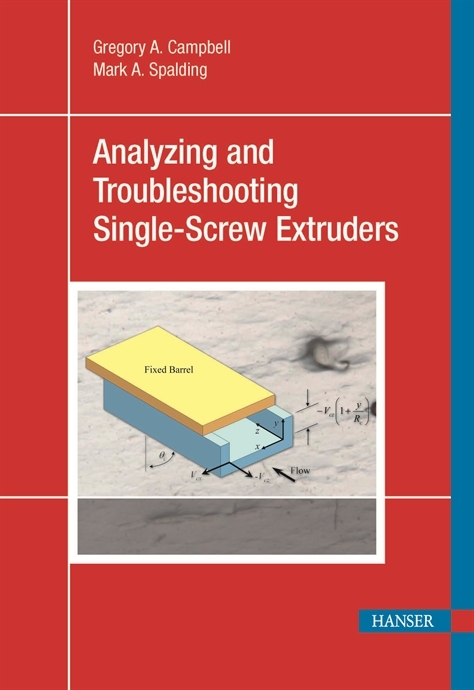 This book addresses all issues crucial in extrusion troubleshooting. In addition, industrial case studies, richly illustrated with photographs and photomicrographs, are used to provide exemplary approaches to efficient problem analysis and problem solving. 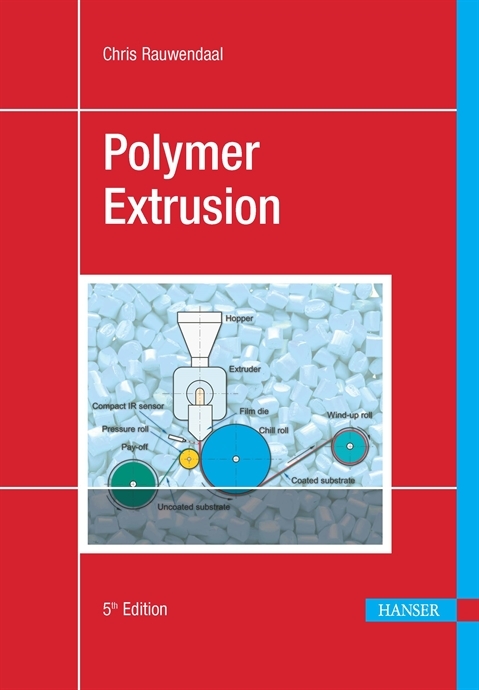 Initially published "to bridge the gap between theory and practice in extrusion," this 5th edition of Polymer Extrusion continues to serve the practicing polymer engineer and chemist, providing the theoretical and the practical tools for successful extrusion operations. In its revised and expanded form, it also incorporates the many new developments in extrusion theory and machinery over the last years. Chris Rauwendaal, president of Rauwendaal Extrusion Engineering, Inc., (REE, Inc), has experience in a wide range of extrusion operations, including fiber spinning, film, sheet, tubing, medical tubing, pipe, and profile extrusion, co-extrusion, and reactive extrusion. Rauwendaal holds several patents in the field of polymer processing. He has worked on both practical and theoretical problems, such as screw-and-die design, trouble shooting, modeling and computer simulation, material analysis, and failure analysis.